Last week it was time to say goodbye to the 2019 photography competition exhibits, as all the pictures were taken down and the votes counted. This was our most successful competition and exhibition yet, with 62 total photos from 24 photographers – some familiar names and some new to us. You all supported the exhibition by voting as well, with 226 voting slips submitted, giving a total of 1064 votes (we allowed 5 votes per slip, but not everyone used all of theirs!). The top 12 photos will be made into a calendar for 2020, which will be available from our shop in late summer, so if your name is on the winner’s list we’ll be in touch to ask for the photo files please. Congratulations to all photographers whose photos were chosen – they’ll all be thanked with a free calendar once they’re available. The volunteer’s choice photographers also receive five free postcards featuring their photo. A big thank you to all who supported the museum either by submitting photos or coming along to view and place votes. Next year’s photo exhibition will be on the theme Built in Herne Bay, with entry forms and Terms and Conditions available from our website. 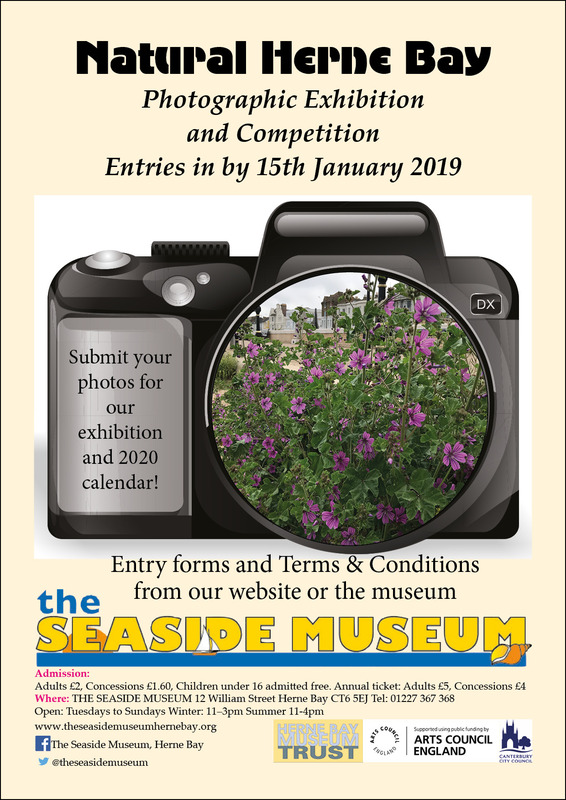 The deadline for entries will be 7th January 2020, ready for the exhibition from the 18th January.